This thing still weirds me out but I appreciate it. Recently I was waiting on Schiphol again. It is a hub that connects many spokes by air plane, bus and train. I wrote about waiting around at Schiphol before. The first wait led to the second post. 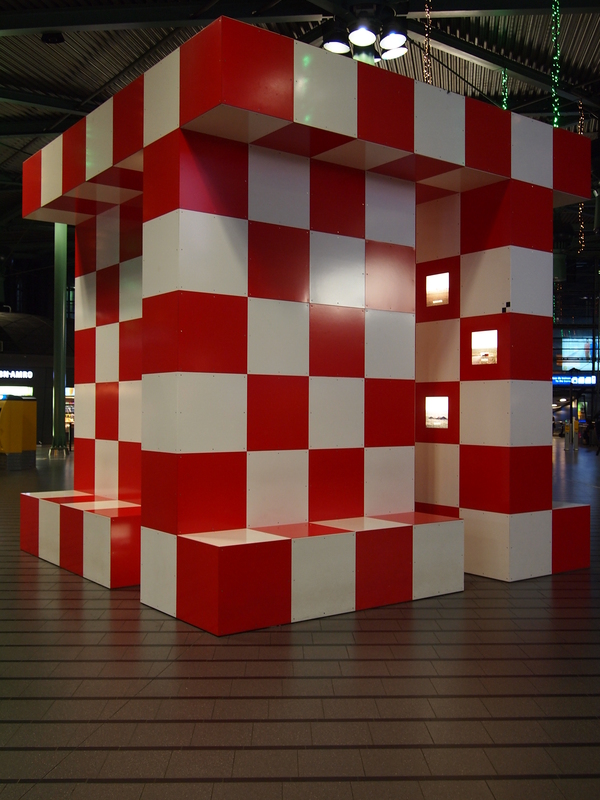 In this post I start by highlighting one of the most unusual things I have encountered in the past years, namely this red and white cube thing. I appreciate this weird thing. It started with seeing it for the first time. This work of practical art immediately stood out by its sheer presence. Colours and size made it inescapable. Then it dawned on me that I could sit on it to read a book. So it became my favourite waiting spot when not too busy. When I am at Schiphol this thing is almost instantly in sight. There is no way to unsee it, you walk around it or wait next to it. The thing with genuinely weird things is that even if you do not have an opinion you will still react to it. Sometimes the weird thing is a piece of art, a monument or a seemingly random object that is simply there. Beyond the thing being a thing it can be music, something graphical or tactile. Often the weird thing defies existing categories and becomes its own category like Picasso, King Crimson or Monty Python. There are moments when properly weird things seem out of place. Even when being aware that change is constant you choose to ignore but that means missing out. Between appreciation of weirdness and ignoring the weirdness this dilemma is always present. Add that life in itself can be demanding and attention span varies per person. Many things I appreciate often do not seem to make sense. I can talk all day about music, the relevance of King Crimson and Frank Zappa, Kate Bush and why more people should re-watch Monty Python’s “The Life Of Brian.” There is more to life than what is conventionally acceptable. Society and mainstream culture do not define everything. Posted in Short Reads and tagged appreciation, art, attention span, categories, change, Frank Zappa, graphical, Kate Bush, King Crimson, life, mainstream culture, Monty Python, monument, music, object, Picasso, Schiphol, society, tactile, things, weirdness on December 1, 2015 by rura88.